South University, Montgomery’s Good Samaritan Club has made a commitment to help keep a local park clean. The club will spend at least one day each quarter picking up trash. In addition to Good Samaritan members, members of the campus Delta Mu Delta Business Honor Society also participated in the first clean up day. The Good Samaritans Club’s mission is “to make a difference in our school, our community, and the world.” The club is centered on helping people around through fundraisers, community service, and volunteering. The group also held clothing drives, collected Christmas gifts for a Children’s Home, and have volunteered both the Salvation Army and Habitat for Humanity. 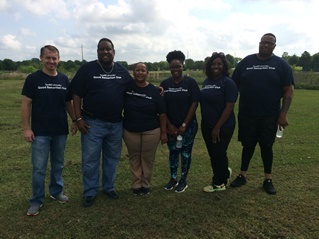 Pictured left to right: Dr. Micah Meek, Faculty Sponsor; Tarrance Scott, Club Treasurer; Cynthia Searight, Club Vice-President; Lawanar Talley; Karen Griffin, Club President; Akeem Johnson; Not Pictured: Dr. John Yelvington and Mrs. Barbara Pughsley, Delta Mu Delta faculty sponsors.